A recent observational study (N Williet et al. 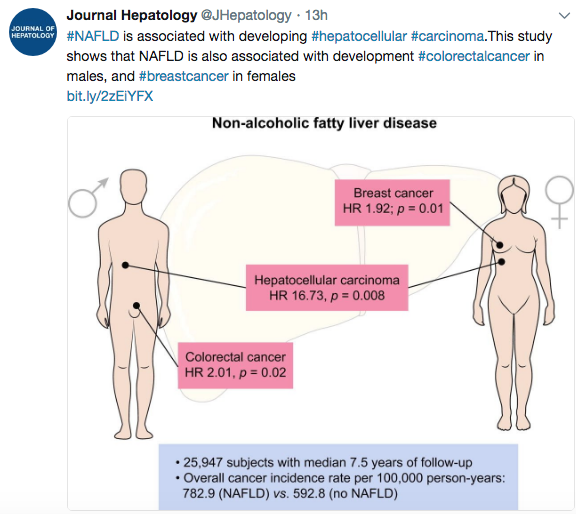 Clin Gastroenterol Hepatol 2017; 15: 1750-7) provides some important information about where we are heading with regard to therapeutic drug monitoring (TDM) with vedolizumab (VDZ). 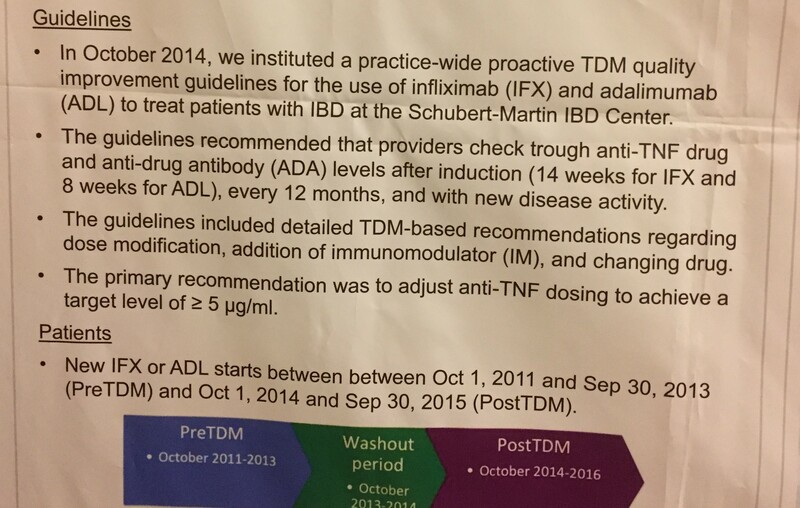 This study enrolled 47 consecutive patients with either Crohn’s disease (CD, n=31) or ulcerative colitis (UC, n=16). 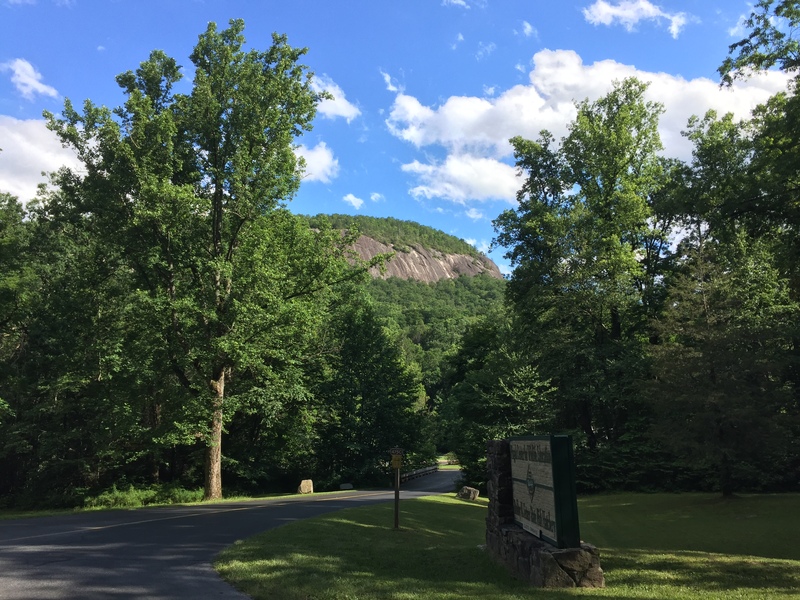 In those without a clinical response at week 6, an additional dose of 300 mg of VDZ was administered at week 10. All patients with a level <19.0 mcg/mL at week 6, regained a secondary response after optimization at week 10. The authors note that in the GEMINI trial, anti-VDZ antibodies were detected in 56 of 1434 patients (3.7%). In this cohort, no anti-VDZ were detected using the same methods. 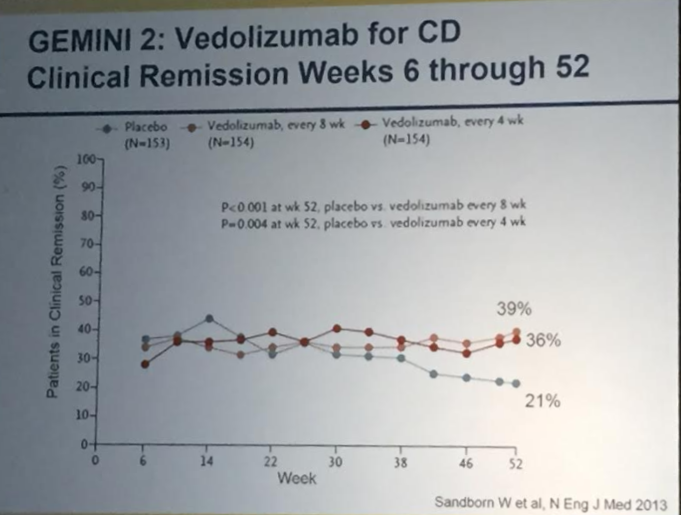 My take: Low trough levels of VDZ at week 6 are associated with the need for drug optimization/increased dosing. The ability to measure drug levels has changed how we think about refractory medical disease, particularly in patients with inflammatory bowel disease. 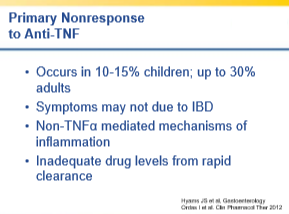 Prior to the availability of therapeutic drug monitoring (TDM), in some situations poor response to therapy could be ascribed to variability in host immune response. Now, it is clear that many cases of refractory medical disease are due to insufficient drug level. 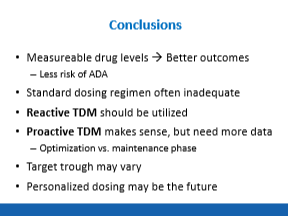 TDM allows for dose individualization to target the right amount of medication. 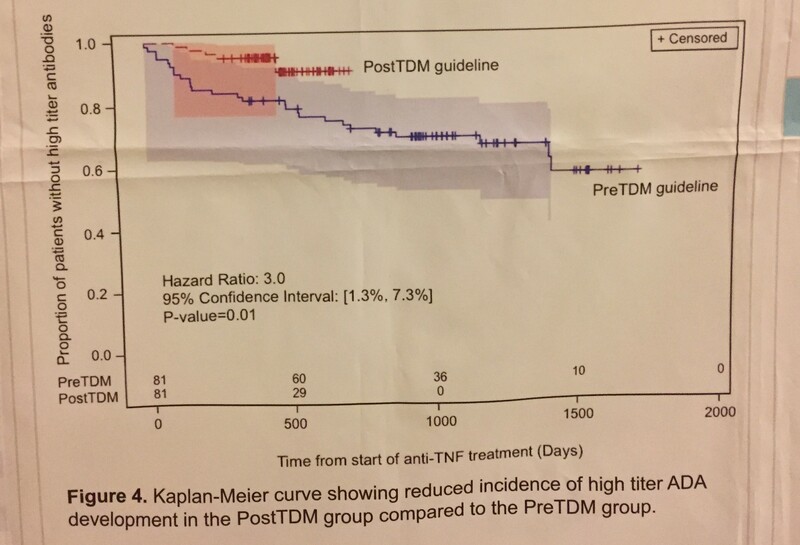 TDM has an accepted role in anti-TNF therapy. Now, a study (R Battat et al. 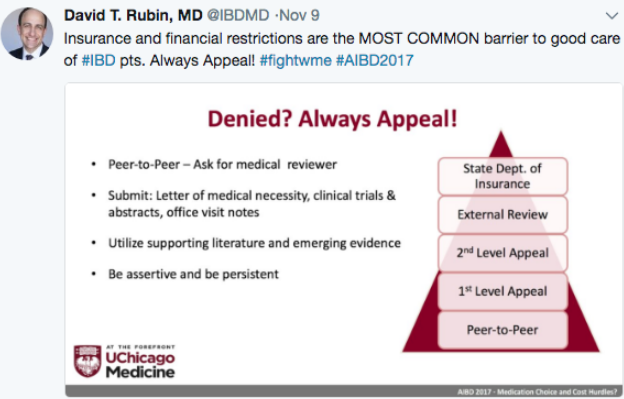 Clin Gastroenterol Hepatol 2017; 15: 1427-34) extends the concept of TDM to ustekinumab. 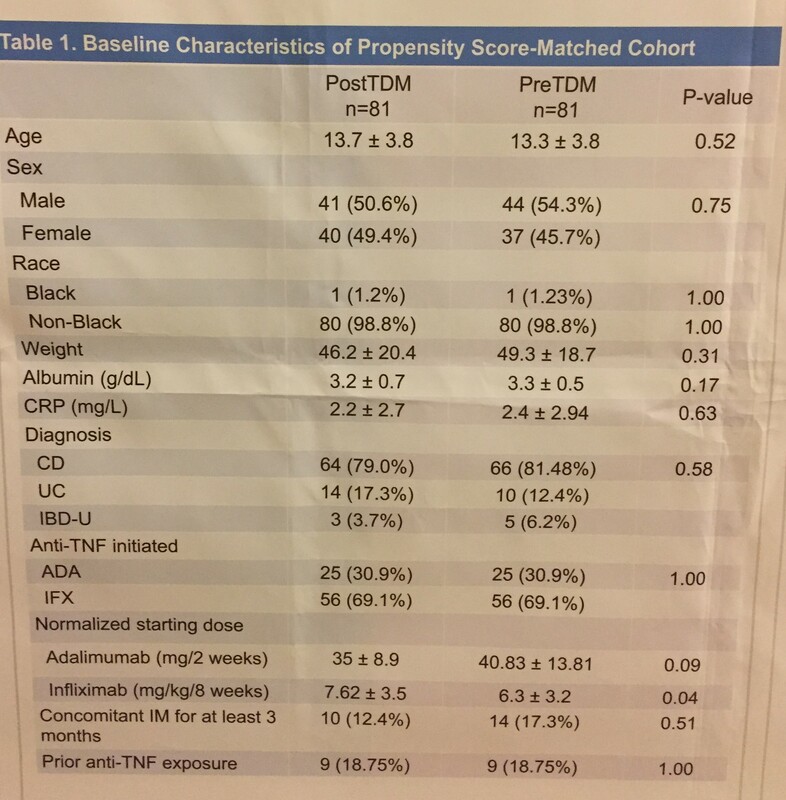 This study which took place between 2014-2015 examined ustekinumab use in 62 patients with refractory Crohn’s disease (CD). 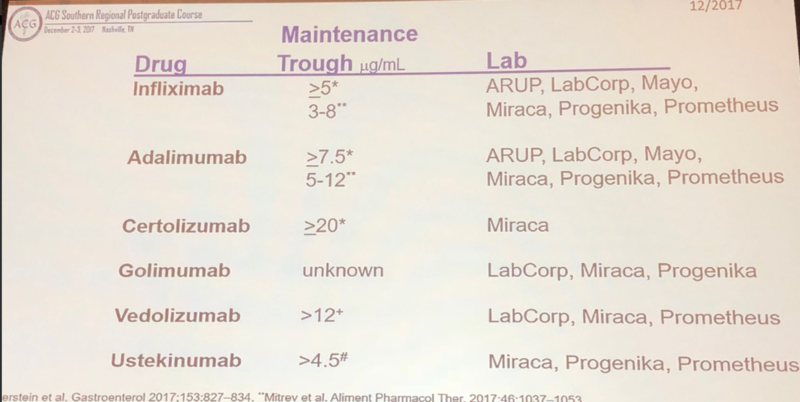 Ustekinumab dosing: 90 mg SC at weeks 0, 1, and 2 for induction, then 90 mg every 4 or 8 weeks for maintenance. 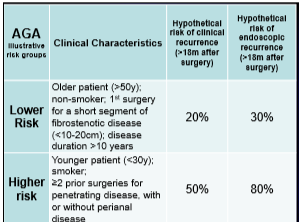 At week 26, 80.7% of patients had a clinical response, 66.1% had a clinical remission, and 58.9% had an endoscopic response. 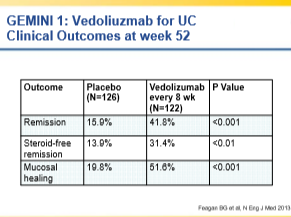 In those with an endoscopic response, the mean trough concentration of ustekinumab was 4.7 mcg/mL compared with 3.8 mcg/mL those without an endoscopic response. The authors did not detect antibodies to ustekinumab in any patient. 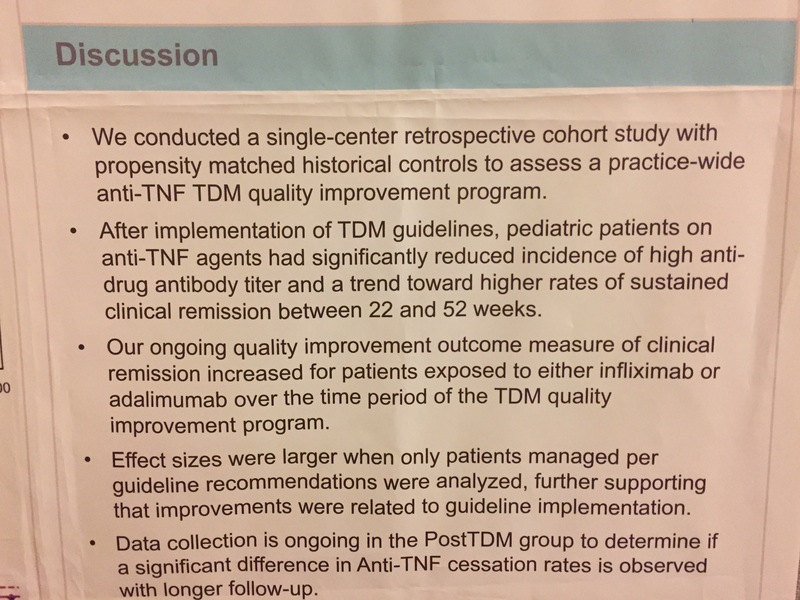 The authors note that ustekinumab has low immunogenicity and prior UNITI studies indicated antibody formation in 0.2% after induction and 2.3% at 1 year. 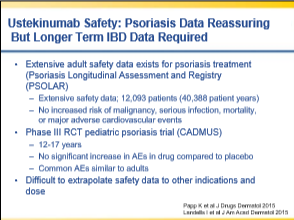 Thus far, no clinical studies have demonstrated improved clinical outcomes with dose escalation in the setting of low ustekinumab levels. A prospective trial would be helpful. 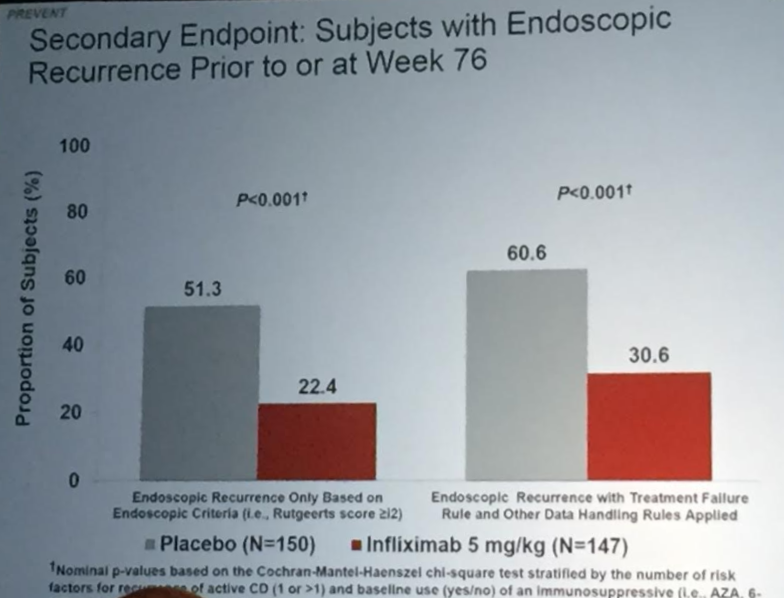 My take: This study shows promising results for ustekinumab for refractory CD. 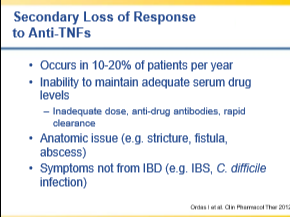 The low immunogenicity indicates that monotherapy is likely appropriate. A target level of >4.5 mcg/mL indicates a higher likelihood of response. 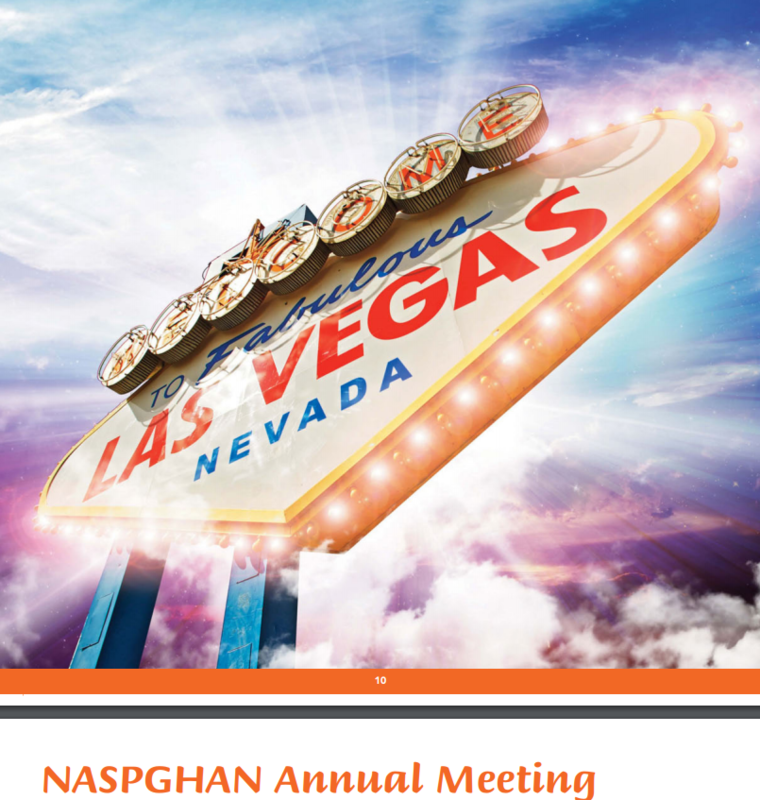 In support of Dr. Baldassano’s talk (NASPGHAN17: Treat to Target and Tight Control), this poster from the Cincinnati group (A Mulgand et al) showed that therapeutic drug monitoring has been associated with improved clinical remission scores (80% to 87%). Correlation with a more objective marker of remission along with longer followup is now needed. One of the authors, Dana Dykes, has joined our group in Atlanta! 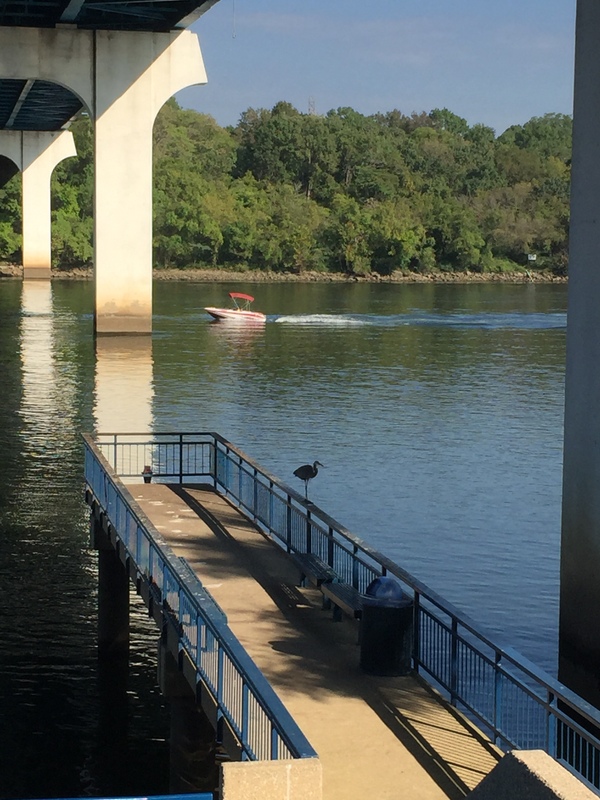 The topic of therapeutic drug monitoring, both reactive and proactive, has been discussed numerous times on this blog. This talk provided a good review of this topic. Large study (PREVENT) to compare infliximab and placebo after surgery. 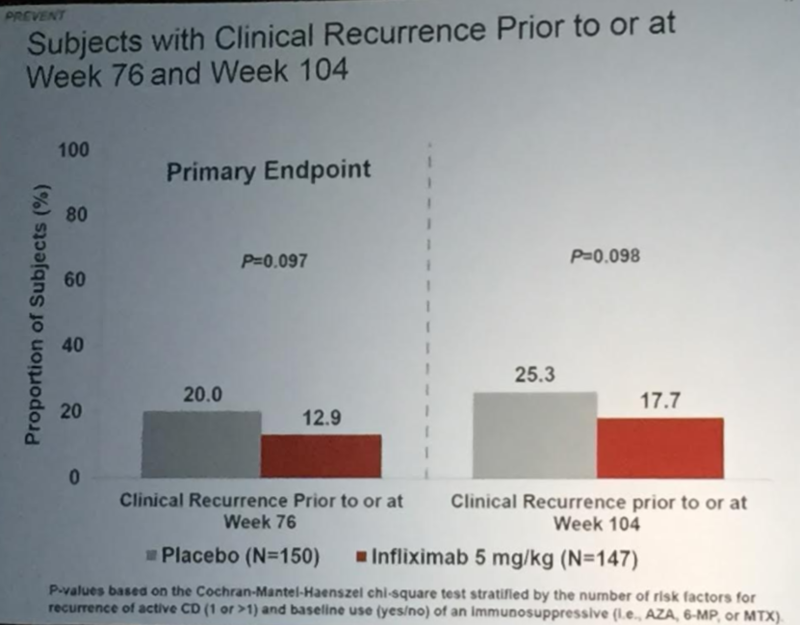 Primary endpoint was clinical recurrence (was endpoint demanded by FDA) even though clinical recurrence can be a late finding. 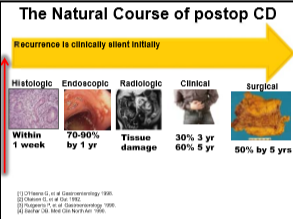 Endoscopic recurrence rate was a secondary endpoint. 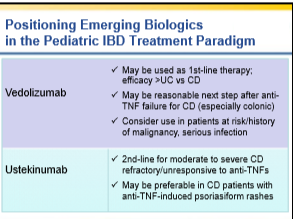 Thiopurines: the guideline suggests TPMT testing of enzymatic activity or genotype before adults with IBD start treatment with thiopurines. 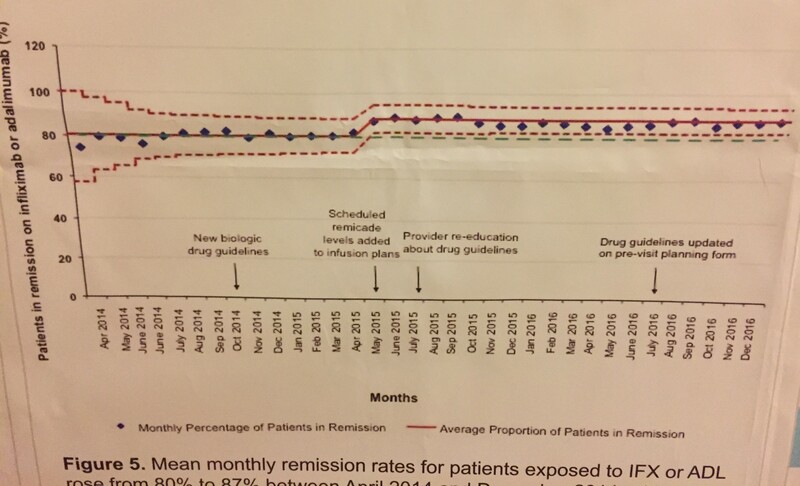 New biologics: the guideline does not address therapeutic drug monitoring in patients treated with Entyvio (vedolizumab, Takeda) or Stelara (ustekinumab, Janssen) due to a lack of available data. Reference: JD Feuerstein et al. Gastroenterol 2017; 153: 827-34. Technical review: NV Casteele et al. Gastroenterol 2017; 153: 835-57. My take: Therapeutic monitoring has become widespread and is quite helpful. 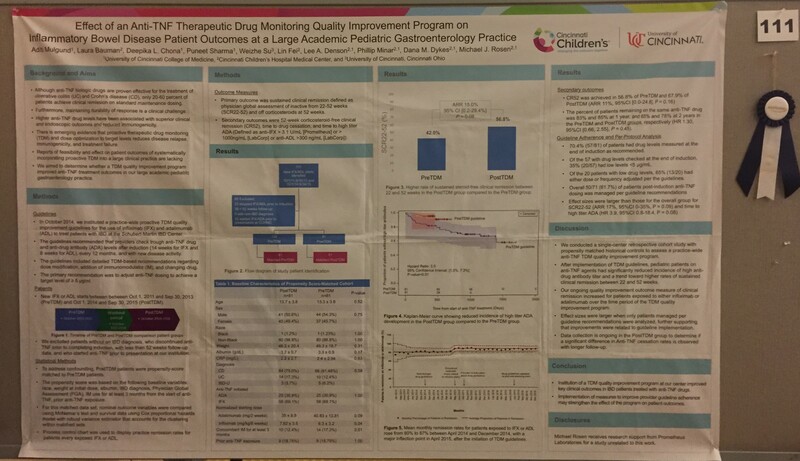 My impression is that most pediatric gastroenterologists have adopted both proactive and reactive monitoring.